All materials from Ben Franklin Crafts and Frames in Redmond. 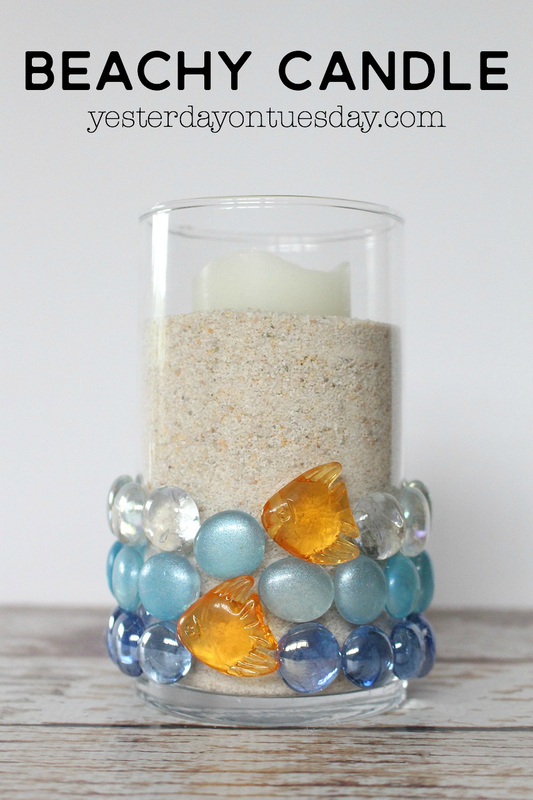 Give a plain glass cylinder a nautical look with some beachy hued glass gems! Supplies: Glass cylinder, sand, glass gems (these are by Darice and they come with “fish” as well as the round gems) and hot glue. 1. Divide the glass gems by color. 2. Starting at the bottom of the cylinder, use hot glue to add gems in one color, putting a fish in the middle. 3. Continue with another layer of gems in a different color, adding another fish. 3. Finish the final layer with a third color. 4. Add sand and a flameless candle. 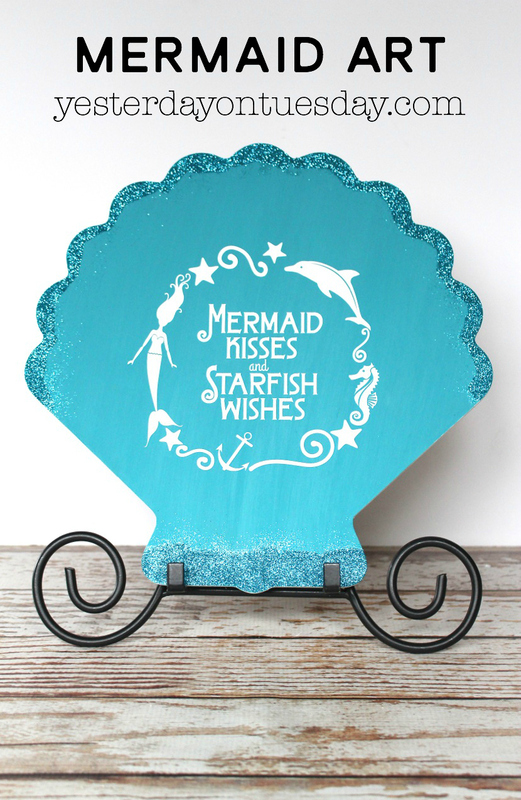 Supplies: Shell shape sign, acrylic paint (in white (we used Snow by DecoArt) and whatever color you choose, we used Desert Turquoise by DecoArt), coordinating glitter (we used Ultra Fine Teal by Nicole), Mod Podge, and vinyl mermaid art from Decorating Your Life. 1. Paint the sign white. 2. Paint the sign your chosen color (may take 3 coats to achieve desired color). 4. Paint Mod Podge on the ends of the shell and quickly sprinkle glitter on it. If you love the ease of succulents, you’ll really want to get yourself some air plants! There’s no water necessary… just give them a daily mist of water. Supplies: Large shells and air plants. 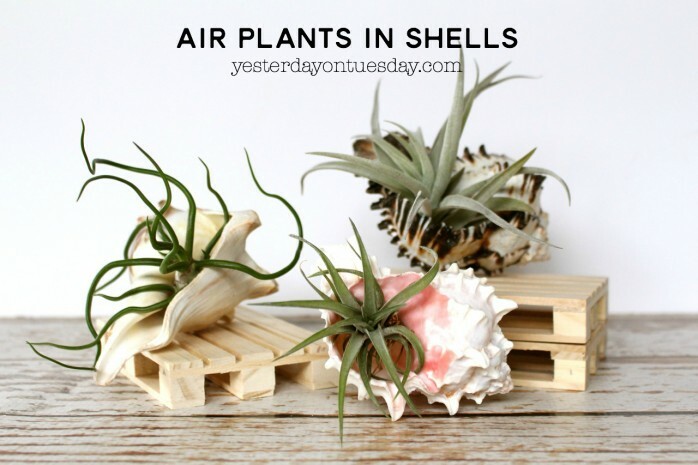 Place the air plants in the shells… that’s it. Tillandsia are epiphytes. Epiphytes retain their moisture and nutrients in cells on their leaves instead of feeding through their roots. 1. A dry habitat with daily misting, or Tillandsia may be soaked for 30 minutes once weekly. Never allow the plant to remain wet for more than four hours. 3. Average temperature of 70 degrees. 4. Indirect bright light with periods of darkness. 4. Add some Mod Podge to the tips of the shell shape and sprinkle glitter on them. 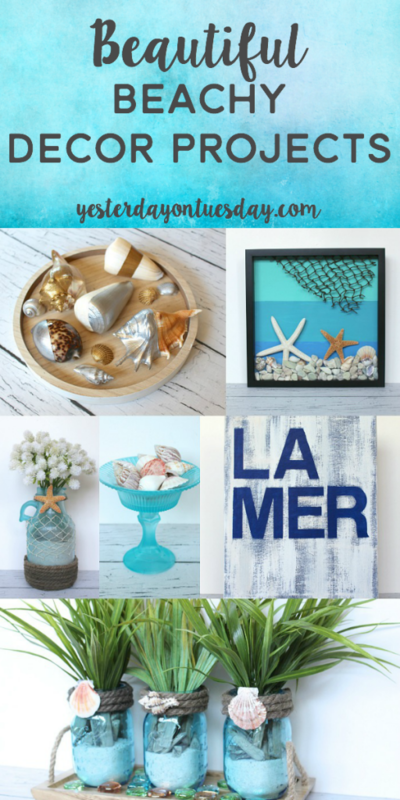 If you find a lovely piece of beach treasure… frame it! Or buy it and frame it. 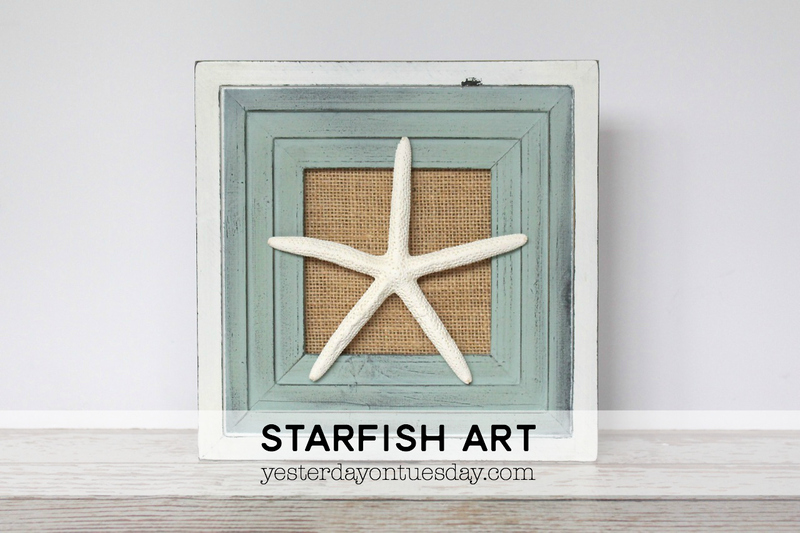 Supplies: wooden frame, burlap, starfish and hot glue. 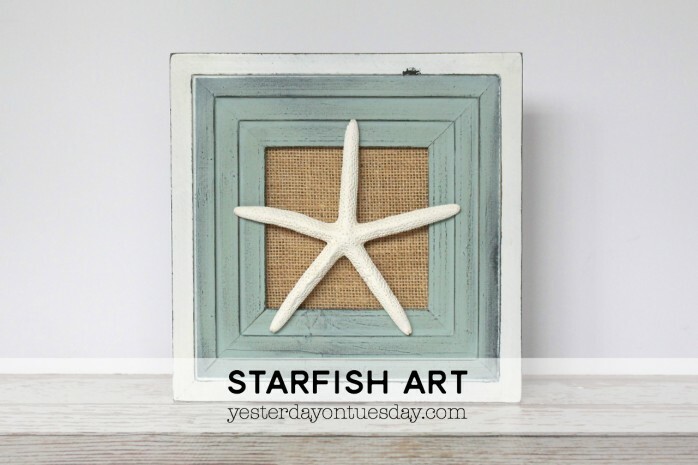 Frame a piece of burlap and hot glue a starfish on top. 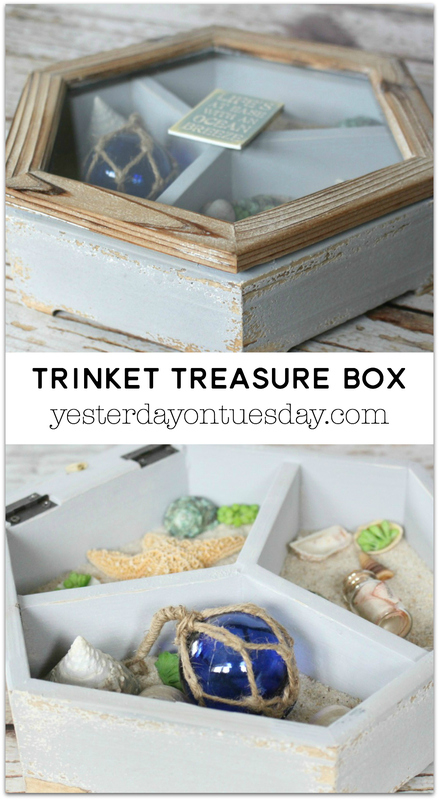 Savor those beachy summer memories with a Trinket Treasure Box! Supplies: wooden box, sand, shells, trinkets and a sticker. Add sand and treasure to the box and place a sticker on the lid. 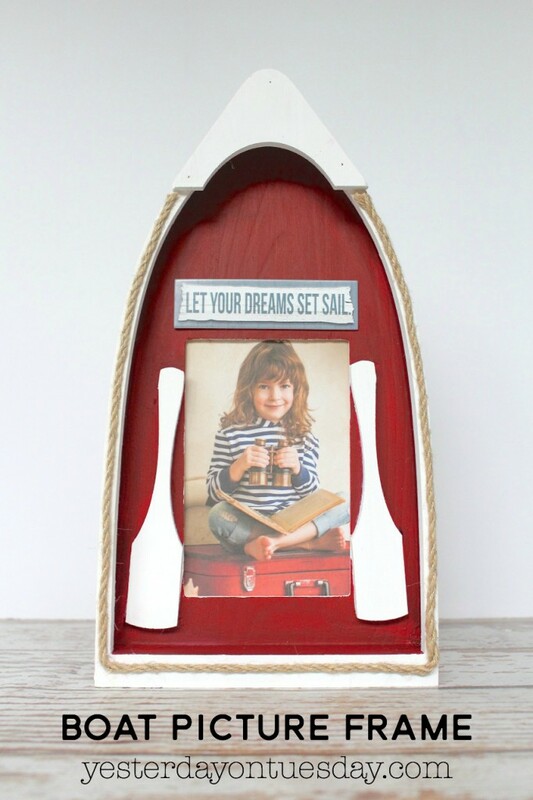 Sail away to adventure with this cute boat-themed picture frame. Supplies: Wooden Boat Frame, acrylic paint in white (we used Snow by DecoArt) and red (we used Alizarin Crimson by DecoArt), masking tape, rope, hot glue and stickers. 2. Tape off trim and paddles. 3. Paint the boat red. 5. Hot glue rope on the front of the frame. 6. Add sticker above the place for the photo. 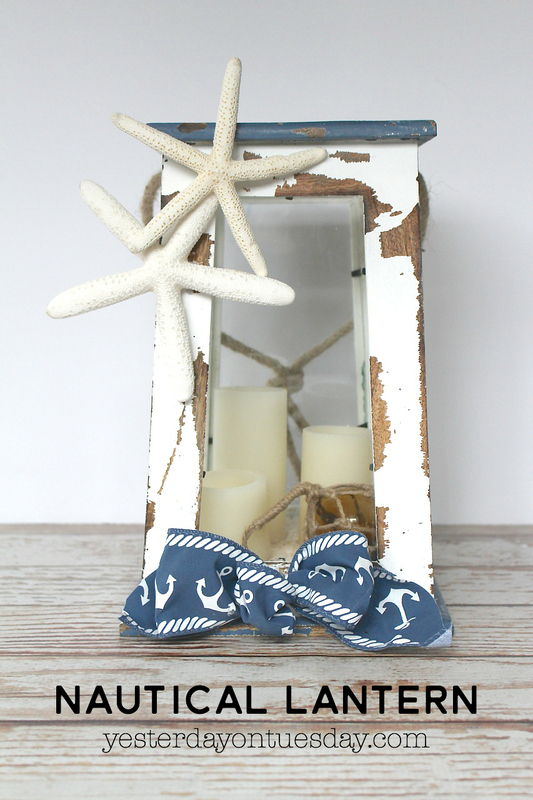 Light the way with this Nautical themed Lantern. Supplies: Lantern, three flameless candles, a wooden circle, sand, a mini glass floater, ribbon, starfish and hot glue. Add wooden circle to inside of lantern. Cover with sand and and candles. Make a bow and hot glue it to bottom of lantern. Fasten two starfish to font of lantern with hot glue. Love your ideas! I really like the air plants in seashells. 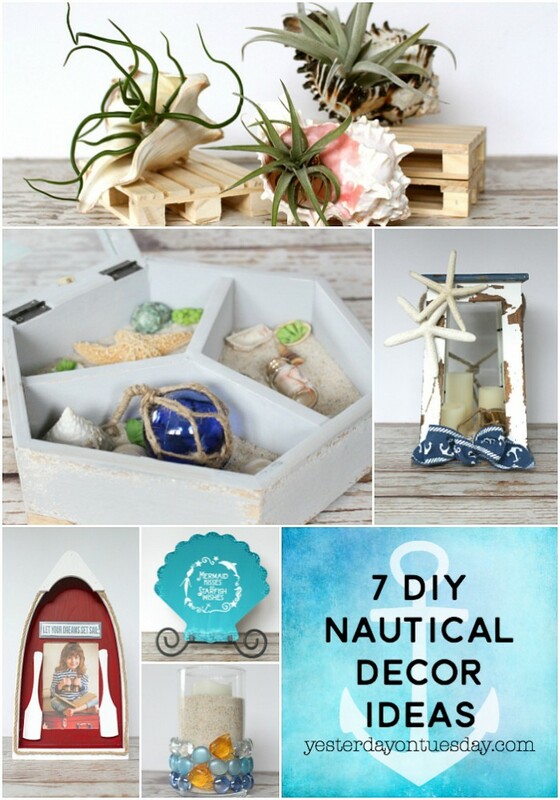 I have a beach-y mantel that needs a few more items. Visiting from Creativity Unleashed. Thanks Victoria, I love your blog name! Wow, all of these are so cute and bring so much character! They all look fantastic and seem like they’d be relatively easy to create on your own! Very nicely done! Thanks so much for sharing!